The top diplomats of South Korea and the US pledged united efforts to deal with North Korea’s nuclear and missile programs, as the allies’ leaders seek another summit with North Korean leader Kim Jong-un amid the stalled nuclear talks between Pyongyang and Washington. 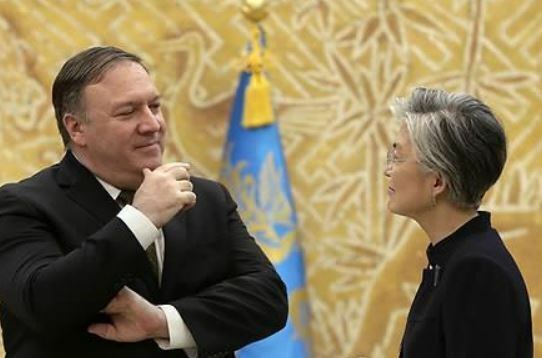 Foreign Minister Kang Kyung-wha and her US counterpart Mike Pompeo held a meeting in Washington on Thursday, the first since they met in Seoul after Pompeo’s trip to Pyongyang in October. The meeting came amid efforts in Seoul and Washington to hold another summit with North Korea. Kim Jong-un is expected to meet President Moon Jae-in in Seoul this month and to hold the second summit with Trump early next year. Kang and Pompeo “pledged to maintain close coordination to ensure the final, fully verified denuclearization of the Democratic People’s Republic of Korea,” said the State Department’s spokesperson Heather Nauert, using the official name of North Korea. The Ministry of Foreign Affairs said in a statement that Kang and Pompeo pledged to work together to achieve complete denuclearization on the Korean Peninsula and establish permanent peace here. The Foreign Ministry also said the top diplomats reaffirmed the importance of enforcing sanctions on North Korea, after discussing progress in inter-Korean relations and the prospect of further US-North Korea talks. Kang and Pompeo also pledged to work on negotiations on how to share the costs of maintaining US military presence in South Korea. The cost-sharing deal is scheduled to expire at the end of the year. “In terms of ongoing negotiations on the cost-sharing deal, (Kang and Pompeo) agreed to encourage both parties’ delegates to come up with results that can be mutually beneficial to the US and the South,” the ministry said in a statement. Denuclearization talks between Washington and Pyongyang have stalled since their first-ever summit in Singapore, with the two sides locking horns over which side should make concessions first. The US demands North Korea first show its commitment to a detailed road map for full, verified denuclearization, starting with the declaration of its nuclear weapons and fissile material, before receiving any significant rewards. North Korea, however, says it will take significant steps toward denuclearization only if Washington takes “simultaneous and reciprocal” actions, most notably the easing of economic sanctions on the communist country.